Can Excessive Vitamin D Supplements Cause Muscle Cramps? You get between 80 and 90 percent of the vitamin D your body needs through exposure to sunlight, according to Medline Plus. Small amounts come from your diet through fortified foods such as milk and cereal. Fatty fish such as mackerel and herring contain small amounts. Vitamin D supplements are used both internally and externally to treat a number of conditions ranging from osteoporosis and heart disease to rheumatoid arthritis and psoriasis. Taking vitamin D supplements is safe unless you take too much, in which case you could experience side effects. You should consult your doctor before taking any supplements to make sure they don't interfere with ongoing treatments or other conditions you have. According to Medline Plus, taking vitamin D supplements typically does not cause side effects unless you take doses of 4000 international units or more for long periods of time. According to the Office of Dietary Supplements, from the ages of 1 through 70, you need about 600 IU of vitamin D per day. After 70, you should increase it to 800 IU. One of the dangers of taking too much vitamin D is that it increases the risk your veins and muscles will develop calcifications. Tissue and vascular calcification can lead to heart disease and damage your liver and blood vessels. Unintended weight loss, fatigue, nausea, loss of appetite and muscle weakness also can occur. While it's possible you may have muscle cramps, it's more likely that you will experience abdominal cramps from a toxic overdose of vitamin D. Vomiting is another side effect you will experience at the onset of vitamin D toxicity. 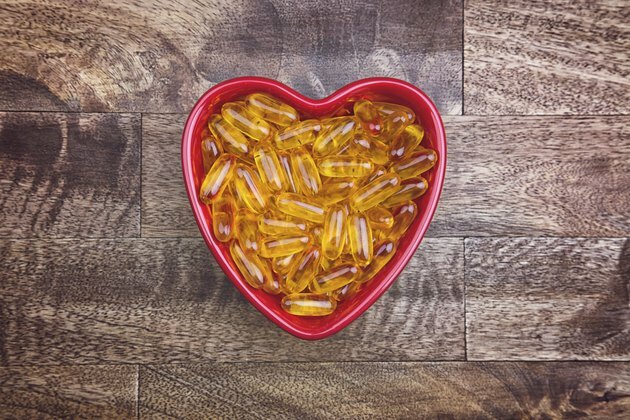 The side effects of taking excessive vitamin D vary and could include abnormal heart rhythms and an abnormal taste or tingling sensation in your mouth. Once abdominal cramps start, you may alternate between diarrhea and constipation. Headaches, dry mouth and sleeplessness are other common side effects of excessive vitamin D supplementation. Vitamin D can increase calcium levels in the bone, which many people require to prevent bone loss. However, if you have kidney disease, excess calcium can lead to hardening of the arteries. Increased calcium levels also are dangerous if you have an over-active parathyroid gland, artheriosclerosis or lymphoma. Vitamin D supplements can be harmful when taken with other medications such as digoxin for heart disease, atorvastatin for high cholesterol and diuretics for kidney disorders.